Chabad.org and Jewish.tv in conjunction with the Chabad Mumbai Relief Fund is offering a embedded player for you to broadcast the memorial for the victims of the 26/11 terror attack on the Chabad House in Mumbai. The event will include a musical tribute and memorial service by Chassdic singer Benny Friedman. 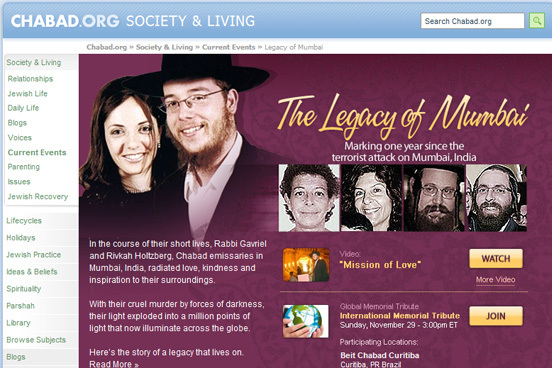 If you would like to get more info about the Holtzbergs and the other kedoshim, list a mitzvah they will do in the honor of Gabi and Rivki, share experiences they had at Chabad in Mumbai before the attacks, or take part in the rebuilding of the Chabad house by sending donations please visit www.chabad.org/mumbai .